There has been a Significant Name Change to a hill that is listed in the Y Trichant, with the summit height, drop and status of the hill being confirmed by a Trimble GeoXH survey which took place on the 19th April 2018. Y Trichant – Welsh hills at and above 300m and below 400m in height that have 30m minimum drop, with an accompanying sub category entitled the Sub-Trichant consisting of all Welsh hills at and above 300m and below 400m in height that have 20m or more and below 30m of drop. The list is authored by Myrddyn Phillips and the Introduction to the list and the re-naming and publication history was published on Mapping Mountains on the 13th May 2017. The hill is adjoined to the Beacon Hill range of hills, which are situated in the north-eastern part of Mid and West Wales (Region B, Sub-Region B1), and is positioned with the A488 road to its south and has the small town of Tref-y-clawdd (Knighton) towards its east north-east. 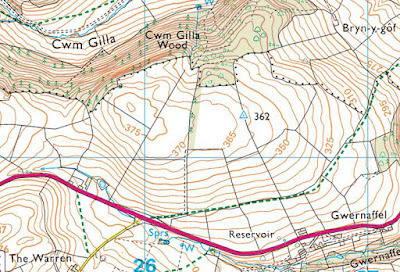 The hill appeared in the 300m P30 list on Geoff Crowder’s v-g.me website under the partly invented name of Moel Gilla, with an accompanying note stating; Name from cwm & wood to the North. Name from cwm & wood to the North. During my early hill listing I thought it appropriate to either invent a name for a hill, or use a name that appeared near to the summit of the hill on Ordnance Survey maps of the day. My preference was to use farm names and put Pen, Bryn or Moel in front of them or as in this instance, use the name of a cwm and wood and prefix this with the word Moel. This is not a practice that I now advocate as with time and inclination place-name data can be improved either by asking local people or by examining historical documents, through this form of research an appropriate name for the hill can usually be found. 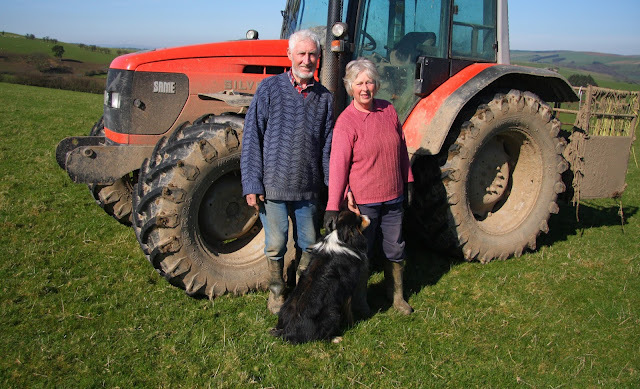 When visiting this and adjacent hills I was fortunate to speak with a number of local farmers including John and Liz Roberts of the Racecourse Farm (SO 267 732), who I met at the summit of Waun Sidan (SO 250 726), it was an easy task to point to this hill across the intervening Cwm Gilla and ask its name, John told me it is known as Gwernaffel after the estate house of the same name which is situated at SO 267 706 and which has association with Sir Robert Green Price. Therefore, the name this hill is now listed by in the Y Trichant is Gwernaffel, and this was derived from local enquiry.